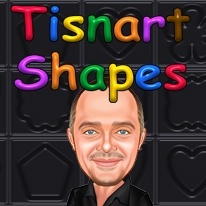 Tisnart Shapes delivers an exciting unique take on the familiar match game styles. There are many challenges for you to conquer, twists and turns that await you on each new level. Dice Blockers, Rivet shields, Rotators, Shape Shifters and more will be there to surprise you just when you think you know what to expect. There is even much more to discover! Interesting new Power-Ups like the Shape Magnet, Clonning Grabber or Double Slider to name a few. Use your solving skills in 90 different puzzle levels or try completing all 72 achievements and more.......Ready for something new? - 11 Power-Ups like the Shape Magnet, Double Slider, Cloning Grabber to mention a few! - 6 Boosters – Shuffle, Swap, Pause Time and more! - Board Items, Shields and Blockers, like the Power Shields, Dice Blockers, Riveted Shields, Shape Makers, Rotators, Shape Shifters and so many more! - 3 different Achievement areas, Progress, Challenge and For Fun. A Card Shop to trade for Boosters and a Themes area to change borders, backgrounds and in-game music.